Pitt is in good form as Gerry, a protagonist who relies more on brains than brawn to find his way out several sticky situations. Some characters (notably the Israeli officer who helps Gerry get from Israel to Wales) are underdeveloped. Given all the turmoil that surrounded the making of World War Z, which reportedly went through several rewrites and a few extra weeks of shooting before the finished product was complete, you’d expect the film to be a train wreck. But director Marc Forster (Stranger than Fiction, The Kite Runner) capably keeps the film on track and delivers a good mix of suspense and action while doing so, lending hope to the studio’s dream of turning the concept into a franchise. The film commences with a graphic scene in which zombies begin running amuck in New York City. 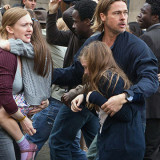 Gerry Lane (Brad Pitt), a former United Nations operative, takes his wife (Mireille Enos) and children to an apartment in Newark and calls his former boss at the United Nations to request an emergency airlift. He’s eventually rescued and taken to an aircraft carrier. But unless he offers to help find the source of the zombie invasion, he and his family cannot stay on the carrier. So he reluctantly agrees to take a flight to South Korea, the site of one of the first zombie attacks. While nothing good comes of his trip to the U.S. military base in South Korea, he picks up a few clues that send him off to Israel and then Wales as he searches for some kind of explanation for and antidote to the viral infection that’s turning millions of humans into flesh-eating zombies. While global in scale, the film isn’t entirely different from an episode of The Walking Dead. Still, it has plenty going for it. Pitt is in good form as Gerry, a Jason Bourne type of character who relies more on brains than brawn to find his way out several sticky situations. And though some characters (notably the Israeli officer who helps Gerry get from Israel to Wales) are underdeveloped, the film’s well-paced and doesn’t rely excessively on special effects to deliver the goods.